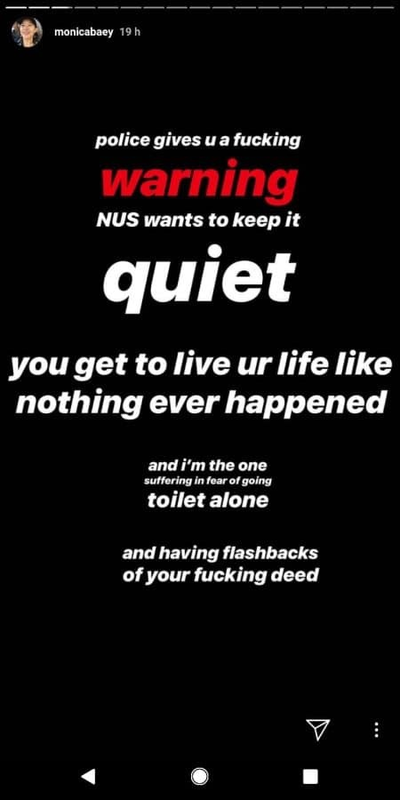 On 19 April 2019, NUS student Monica Baey published a string of Instagram Stories about a fellow student, Nicholas Lim Jun Kai, who had filmed her showering in her hostel’s bathroom last November. Immediately after the incident, Monica lodged a report with campus security on 25 November 2018, who simply requested for the police case number if she decided to proceed with a police report too. The following day, she went to the police. Over the phone, Monica shares with me that after the police meted out their sentence for Nicholas (i.e. a 12-month conditional warning, because he was a first-time offender), they advised Monica to approach NUS if she wanted further action. She then provided NUS with her statement, WhatsApp conversations, and CCTV footage that documented how Nicholas had previously snuck into another toilet. Within a day, NUS told Monica she’d sent them her statement “a bit late”, and that they’d already arrived at a punishment. They claimed they’d taken her statement into account, but said the outcome “would have been the same”. 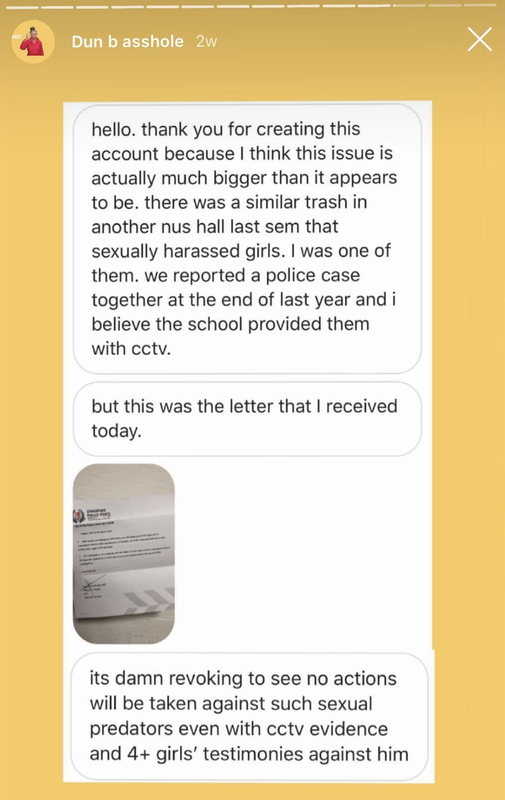 For filming a female student in a toilet, Nicholas was suspended from school for one semester, banned from entering campus residences, and made to write Monica a compulsory apology letter and attend compulsory counselling sessions. 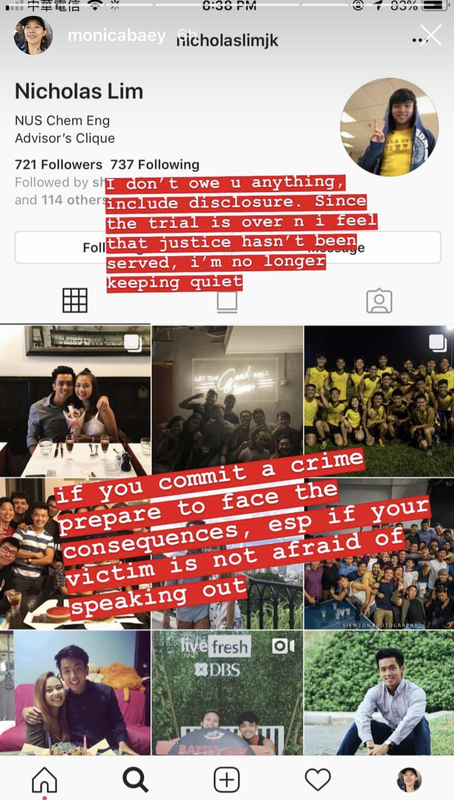 Monica questioned NUS if this was “all” that Nicholas was getting, since a one-semester suspension was akin to going on a Leave of Absence or Overseas Exchange, which was what many regular students did anyway. After all, men have previously been jailed for filming people in public toilets. In other words, there was a disturbing lack of serious, visible consequence that would reassure female students the university would support them in cases of sexual misconduct, or warn potential perpetrators that they would be similarly punished. NUS also told Monica this was the “most serious punishment [they] can give someone because it deters his graduation and he has to explain to his family and friends why he’s not in school”— almost as though he was the victim here, not her. Moreover, NUS did not offer her any form of victim support throughout the investigation. The only time they brought up any concern for her well-being was to inform her that she could “just let [them] know” if she needed counselling. Yesterday at an educational conference in Singapore, World Edulead 2019, Professor Pasi Sahlberg, an educational researcher from Finland, shared about equity (fairness) in education systems around the world. At one point in his presentation, (he was using OECD PISA results to compare countries), he asked the conference hall of about a thousand school teachers, school administrators, and education ministry officials from Singapore and abroad, he asked us to turn the person next to us and predict where our country would fall on a graph that plotted student achievement against equity of outcomes. And by equity of outcomes, meaning that how much students could achieve regardless of family socio-economic status. A measurement of how much your family's SES determines or doesn't determine your educational achievement. A measurement of the extent to which kids from poor families are able to beat the odds stacked against them. I turned to the person next to me and predicted that Singapore would probably do really well in terms of academic achievement (we are tops in PISA - tests in English, Maths and Science). And I thought, maybe we wouldn't do that fantastically in terms of equity, after all we all know (although that data is not publicly available) that students in Normal stream, in "neighbourhood schools" tend to come from lower SES families, while students in Express stream, in "top" schools tend to come from high SES families. We know that richer families have the disposable income to spend on private tuition, enrichment classes and educational resources. But I still believed while we would not be fantastic in terms of equity, we still shouldn't fare too badly, considering how much we spend on public school education so that all our govt schools are well resourced, our teachers and principals centrally hired and trained, our curriculum kept up to date and responsive to the changing needs of the 21st century. And on top of that, our network of school subsidies, bursaries and financial assistance ensures that no child is denied an education because the family cannot afford it. 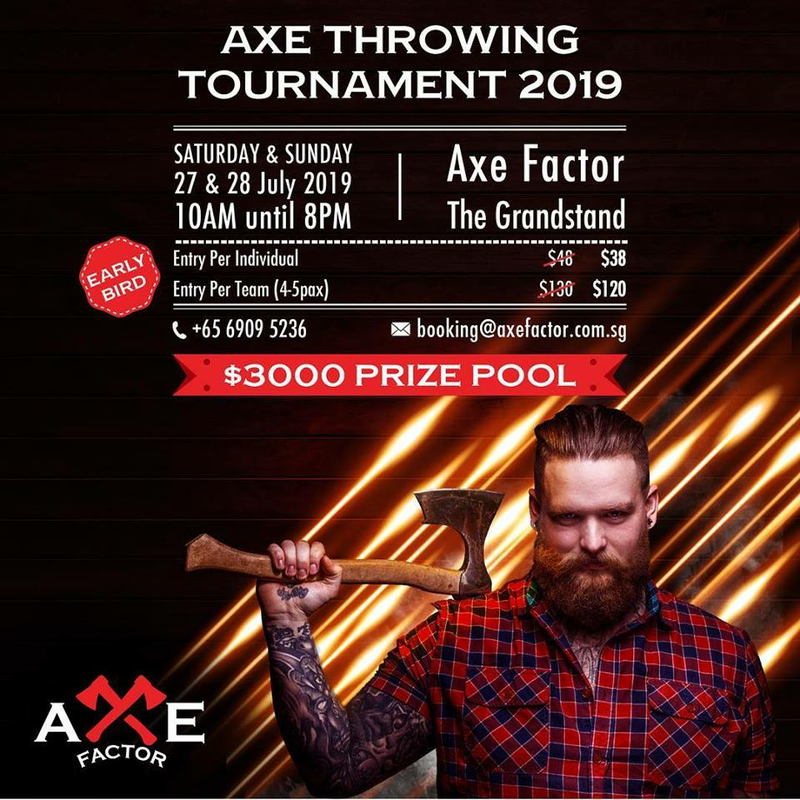 Chit Chat Corner / Axe throwing competition in SG! Who wants to be the next Thor? A father and son lifesaving team drowned while trying to save a tourist swept out to sea near one of Australia's most famous sights off the south coast, officials said Monday. Ross Powell, 71, and his son Andrew, 32, died on Sunday after their lifesaving boat overturned in the surf during the rescue of a 30-year-old man near the Twelve Apostles, a set of 12 limestone stacks off the Victoria state coast. The tourist, whose nationality or name has not been released, had been wading at the mouth of a river when he got into trouble. He was winched from the water alongside a third lifesaver from the boat, who was seriously injured, by a rescue helicopter and taken to hospital, Victoria Police said. The bodies of the Campbells were found in the water shortly after. The tragedy has rocked the small tourist town of Port Campbell where the two men came from, with Prime Minister Scott Morrison leading the tributes. "Surf lifesavers are selfless & brave. We thank them all for their service & extend our deepest sympathies to Ross & Andrew's family & friends," Morrison tweeted Monday. Surf Lifesaving Victoria president Paul James hailed the pair as heroes, and said the conditions had been rough and "not the place to be swimming". Mueller identified at least 10 instances of potential obstruction of justice by the president, fanning calls for Trump’s impeachment from progressives such as 2020 presidential candidate Elizabeth Warren and freshman Representative Alexandria Ocasio-Cortez. That’s testing the party unity House Speaker Nancy Pelosi has been battling to preserve in order to move on her agenda. Ocasio-Cortez, of New York, said she would sign on to an impeachment resolution already introduced by another first-term Democrat she’s closely aligned with, Representative Rashida Tlaib of Michigan. "Many know I take no pleasure in discussions of impeachment. I didn’t campaign on it, & rarely discuss it unprompted," Ocasio-Cortez, a first-term lawmaker from New York, tweeted after the release of the Mueller report Thursday. "But the report squarely puts this on our doorstep." News, Current Affairs Discussions / Re: Nicholas Lim is the pervert who filmed NUS girl Monica Baey showering. 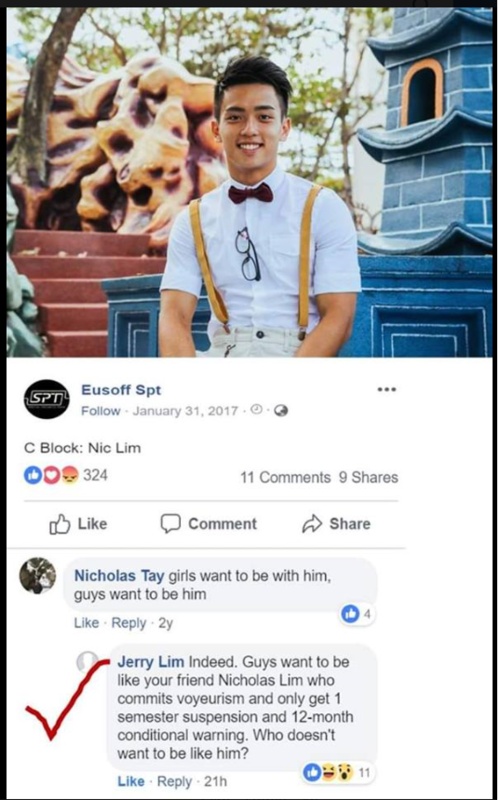 News, Current Affairs Discussions / Nicholas Lim is the pervert who filmed NUS girl Monica Baey showering. News, Current Affairs Discussions / I wish our government will grow a heart, two ears and two eyes. When I enrolled in the National University of Singapore (NUS), my friends who didn't score at least a B3 for the General Paper (GP) subject had to attempt an English bridging module, and must continue retaking it until they finally pass the damn paper before they are allowed to graduate. A girl friend scored 2As and 2Bs, however because she flunked her GP she wasn't even allowed to apply for admission to local public universities. So my question is this, why are we giving free scholarships plus living allowances to students particularly from china, despite their brilliant results, when they can only speak a smattering of the English language? I welcome competition yes, but hey let's compete on fair ground. I don't expect the government to grant us special privileges but in this instance they are obviously shortchanging its own people. Other universities accept foreign students not only because of good grades but also possibly due to them paying higher tuition fees. In Singapore, foreigners get to study for free and can then simply return home. PETALING JAYA: Degree holders are facing a double whammy as they stare at shrinking starting salaries coupled with a declining demand for high-skilled jobs. Bank Negara, in its Annual Report 2018, revealed that real monthly salaries for fresh graduates holding a diploma or degree have dipped since 2010. With the amounts adjusted for inflation, the starting pay for graduates with a basic degree was RM1,993 in 2010 whereas the amount dropped by RM10 to RM1,983 in 2018. Those with a Master’s degree saw an even greater decline in their starting pay. Their real minimum salary recorded was RM2,923 in 2010 while this figure dropped to RM2,707 in 2018. The report, however, noted that the minimum wage has supported increases in the salaries of lower-skilled workers in recent years. The police are investigating a case of an e-scooter rider who allegedly hit a child along Orchard Road on Friday evening (Apr 19). Several Stomp contributors alerted Stomp to a video of the confrontation between the rider and the child's father that was posted to Complaint Singapore's Facebook group page. In the video, a group of women are seen tending to a child as his father hurls vulgarities at the e-scooter rider. According to the post, the father of the kid had allegedly punched the rider after he struck his son. It added that the rider was a Deliveroo delivery guy. A woman is holding on to the man, trying to calm him down and to prevent him from going over to the rider. At one point she even covers his mouth with her hand. The delivery guy shouts at the father and says that he should have been looking out for his kid to which the father replies, "F*** you!" News, Current Affairs Discussions / ICJ: current form of SG Online Falsehood Bill is dubious! The International Commission of Jurists (ICJ) has explicitly labelled Singapore’s Protection from Online Falsehoods and Manipulation Bill dubious and incompatible with worldwide legal principles as far as its present composition and structure is concerned. In its current form, the Bill is viewed as a “real risk” to public interest. Prime Minister Lee Hsien Loong, Deputy Prime Ministers Teo Chee Hean and Tharman Shanmugaratnam, Law Minister K. Shanmugam, and Parliament Speaker Tan Chuan-Jin received an open letter from ICJ’s Legal and Policy Director Ian Seiderman on April 12 on behalf of the Commission. “Critical dissent, free exchange and development of opinions, and free access to information are necessary to maintain an informed society and ensure transparency, accountability and informed debate on crucial matters of public interest,” Seiderman highlighted. The Online Falsehood Bill’s provisions “are likely to be unnecessary and disproportionate in application to legitimate aims of ensuring national security or public order”, he added. As Jet Airways flights finally come to an end, albeit temporarily, rival carriers are jumping in to take advantage of the gap in the market. Over the last week, numerous airlines have taken steps to add capacity, add routes and fill in the Jet Airways shaped hole in the skies. Even before Jet Airways completely suspended flights, they were struggling to stop the competition from encroaching on their turf. With only a fraction of their fleet in service, hardly any of their routes were still operating. The DGCA, India’s aviation regulator, didn’t want valuable slots at Mumbai and Delhi airports to go unused, so they ‘temporarily’ reallocated them. 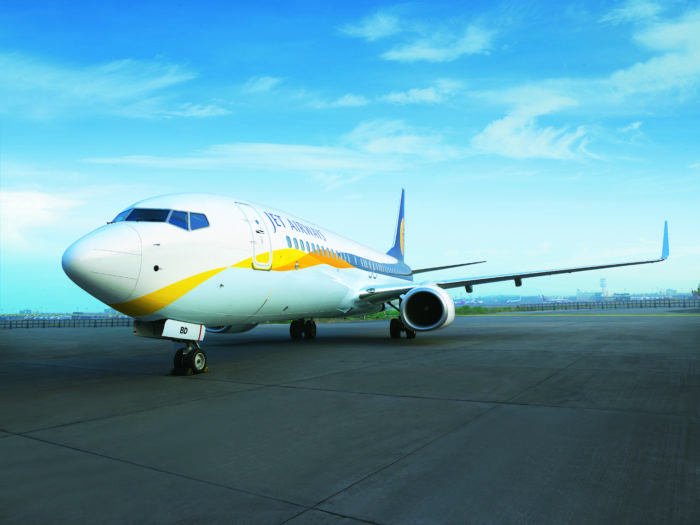 They were snapped up by Jet Airways’ competitors including IndiGo, Vistara, SpiceJet and AirAsia India. We’ve also heard about how SpiceJet have marched in to lease up to 50 of Jet’s unused aircraft. The government were keen to keep capacity in the market, and to save the jobs of pilots, crew and ground staff. But this was all just the start of airlines taking advantage of the demise of Jet Airways.